Recently Chris purchased a tool and provided commentary. Following is our Email exchange. Got the tool yesterday. Looks good and operates very smoothly. Question: being super careful, can one adjust the ferrule ON THE ROD? Thought I would ask before I ruin something. Yes, use it on the rod. Good point, I should say this somewhere in my blog articles. Dynamite. I have a very specific rod in mind. Just finished my first set of ferrules with the tool. It took some work to figure out the best approach and if I did it again, I’d get some scrap ferrules or just tubing to practice on, but I just went for it. Once you go past hand pressure (difficult to keep going by hand on small screw heads) it’s REAL easy to go too far with an Allen key. And, you gotta be real careful of the welt if it is soldered on. Ask me how I know! Anyway, after figuring all that out, I got the hang of it and I got a near perfect fit with one male. And then I realized, “Hey, it’s still too loose on the other one!” Doh! 🙂 I didn’t really think about this from the start. The rod came to me used and the two males had different fits with the female. One is loose enough that it twists during fishing. Like an idiot, I started with the tighter one. Do over. So, first thing I did is get the looser male to as perfectly parallel sided and round as I reasonably could using a mic good for 0.00005″. I chose to fit a male first in case there was a chance of making the female fit non-parallel. Having a really good male to test with would avoid this problem. I don’t have any gauge pins, though I guess I could have turned down some brass stock. Anyway, then I refit the female a second time with your tool. Now from experience: test fit, test fit, test fit. Then the second male. The whole thing is nearly perfect now. Better than the fit I’ve received on some new rods and better than this rod has ever gone together. This happens to be one of those micro ferrules in the Super Z style, ultra short. Not sure if that is easier or harder, but it’s WAY better than it was. So, thank you very much for making this available. I can see it being used many times and I believe it has paid for itself already vs. taking a ferrule off (if you can), replacing with new ferrules or at least males, refitting both cane and metal, re-gluing, re-wrapping and varnishing, let alone shipping to the maker for repair. In case you are writing instructions in the future, maybe some of this is helpful for someone with zero experience with similar tools? Below is some correspondence from Leo. When I have needed to make curved surfaces on reel feet, I have used my mill with either a rotary table fixture or a ball end mill. Leo shows how to do the same tasks with his lathe. The education here is making custom fly cutters. For milling operations, he has made custom vises to hold the work. 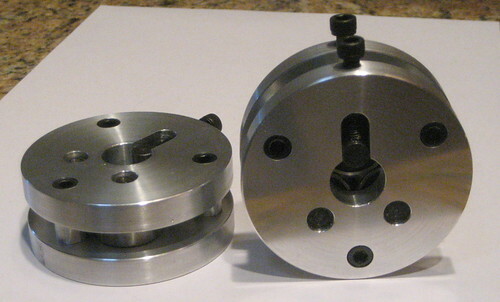 I have made a few fixtures to make machining of reel feet a little more convenient. Maybe theses are of interest to you and others who make reels. The first is a fixture block with a clamping slot on one side. On the bottom of the block is a tenon which fits snugly into a t-nut slot on the milling table, making sure the block is in line/perpendicular with the x and y axis. Two allen bolts clamp the block to the milling table using two t-nuts. The reel foot blank, after being milled to the correct width, gets clamped in the slot to face off the ends. If I had a matching ball nose end mill, I could now also machine the inside radius to fit the reel seat, but I wasn’t able to find one for a reasonable price. After that, the blank gets clamped in the other fixture which mounts on the lathe cross slide. There the inside radius gets machined with a long fly cutter, which receives support from the tail stock at the rear end. This way the inside radius can be made using the lathe’s power feed, leaving quite a good surface finish. One can either hold on to some kind of beverage and watch the lathe do the work, or when making several reel feet sand off the machining marks of the previous one, while the next one gets cut. Huge time saver! The fixture indexes on the cross slide via a tenon on the bottom and bolts to a long t-nut with to threaded holes. Afterwards, the blank goes back to the slot in the fixture block to drill the mounting holes for bolting it to the reel frame. Now, using one of the holes, the blank gets bolted to an arbour to machine the conical outside radius. After that, the blank gets clamped to the other side of the milling block to use a fly cutter to machine the radius to match the outside of the reel frame. I made these fixtures from scrap aluminium blocks I had laying around. It took me the better part of a saturday to make the fixtures, but now it is quite easy to make reel feet. The pieces get held securely, so no more parts shooting into an earth orbit. Also with the fixtures made from aluminium, the parts don’t get scratched, dented or otherwise damaged. There are four reel feet blanks in most of the pictures, because I needed one to replace the foot of reel No.3(because the one made for this reel wasn’t to AFFTA specs and that bothered me), two will be fitted with a pointer to serve as alignment guides when glueing reel seats to rod blanks(this idea came from the bamboo book by Garrison and Carmichael), and the fourth reel foot is for a future project. Reel No.3 has received some anodising and coloring in the meantime. If you want, you can share this on your blog. Might be time for me to start blogging as well. Your use of “fly” cutters for radii is most interesting. Are the cutting edges just a ground scrap of “drill rod” (hard steel small diameter)? There is a group shot of my fly cutter/boring bar holders. Usually there should be more cutters/boring bars around, but I destroyed one or two and a few others just disappeared and I can´t find them. The cutter “1” is for surfacing, and I think I made this one some day because I needed to get a specific job done at that day, so the overall appearence of the arbor resembles the urgency of that situation. It just had to work, as it still does, but no time was wasted on good looks or a specific tool angle, just “some” angle so the grub screw holding the insert clears the work. “2” can either be used as a boring bar in the mill, or when machining reel feet in the lathe, but it can also be held in the boring bar holder “5” for inside threads or similar work. “3” is the short version of “2”, mostly used in the milling machine when the extra length of “2” isn´t needed. Less length, less chatter. “4” and “5” are boring bar holders for the lathe. I made them from leftover steel blocks. One holds 6mm cutters made from drill rod, the other holds 10mm cutters or can be combined with “2” or “3”. I hope this helps you understand my fly cutter/boring bar tooling. This blog post records my setup for cutting ratchet teeth. I having been building reels one at a time, so this setup is needed for each reel. The bushing/ratchet blank is held on a mandrel in a 4 jaw chuck so it can be precisely centered on the rotary table. Put the cutter in front of the work piece so that fuzzy burrs are on the ratchet face that can be trimmed. To get the cutter at the correct height, use a gage block as a feeler gage between the blank and the cutter. Then lower the cutter by a calculated amount. My “gage block” is a scrap of aluminum milled to 0.582 inch height. For the 23 tooth ratchet (3 weight reel) the blank is 0.694 diameter and the cutter is .121 thick. So lower the cutter by (.694 + .121)/2 + .582 = .989 inch. For the 36 tooth ratchet (5 weight reel), (1.056 + .145)/2 + .582 = 1.182 inch. Depth of cut for the 36 DP ratchets is 2.157/36 = 0.060 inch. After milling, the Delrin ratchet has fuzzy burrs that have to be removed. So make the ratchet blank thicker than required. A facing cut will remove much of the burr, but hand clean-up will still be needed. I use a “de-sprue” nipper from MicroMark for this. The problem that I am having with my MiniLathe is that the support of the cutting tool is too compliant. It is really disconcerting when a cut-off blade dives under the workpiece. Chatter is a problem with all types of cutting tools. I believe that most of the compliance is in the compound slide. I have worked with lapping the dovetail and adjusting the gib, but cannot get satisfactory performance. When I have to part off, I would much rather use my Sherline lathe. My solution is to remove the compound whenever possible. Here are two fixtures that allow just that. The first one carries a 3/8 inch diameter round carbide insert. I designed it especially for finishing the inside surfaces of a reel spool. The insert support is 5/16 inch wide so there is clearance on the sides and the front of the insert and I can use it on all interior surfaces. The other fixture is just a spacer that replaces the compound. Having lost the compound leadscrew, I rely on a dial indicator for axial position. There is a problem here, of course. I cannot make fine adjustments and close the half nuts to lock the carriage axially. This is OK for some operations but allows carriage creep for others. So I still need to make a positive carriage lock. I want to make a special brass washer, flat on one side and conical on the other. The stock is 7/16 inch diameter brass, and the cone angle is 60 degrees from parallel to the stock rod axis. It is easy to set up the Sherline lathe for the conical cut, just pull the alignment key from the bottom of the headstock and rotate the headstock CCW by 30 degrees. The cut can then be made by advancing the cross slide leadscrew. When tapers are less than 45 degrees, you advance the axial leadscrew. I have seen headstock rotation only on small lathes like Sherline and Taig. The motor mounts to the headstock and rotates with it. Motors for larger lathes are generally too heavy for this, so tapers are made with a compound slide. So let us see how hard it is to set up this cut with a compound slide. I bought a Chinese minilathe, and am trying to learn how to use it. Just turning the compound 30 degrees CW from axial doesn’t work; advancing the compound would just charge the cutter straight into the material, 90 degrees from the desired travel direction. So let’s rotate on around to 120 degrees CW from axial. Direction is good, but I can’t push the apron assembly far enough toward the headstock to bring the cutter into position. Instead, trying turning the compound 60 degrees CCW from axial. Again, direction is good. But I have to run the compound far back to access the screws that lock angular motion, and then I can’t turn the compound crank because it is up against the chip shield. Final answer: turn the compound 60 degrees CW from axial, and make the cut on the back edge of the part. Of course, the bit has to be turned upside down, and stacked on top of another bit to put the cutting edge at correct height. A conventional lathe with compound slide doesn’t have to be this clumsy. Some have compound angle locks that are more readily accessible, and few have chip shields that get in the way. I am impressed with the simplicity and ease of use of Sherline’s configuration, and would like to see it available on a larger lathe. This might be possible if the headstock was a spindle motor with a suitably large spindle. Leo is good at English composition (as well as many other things) so I will just post his Email as sent. My name is Leo, I’m from Germany, been fly fishing for the second year now. Last fall, I built my first rod, and since I am a hobby machinist for the past fifteen years, I just couldn’t live with a store-bought reel on a homemade rod. So I built a reel, and that’s when the mania started. Your website/blog has been a great help in the process, that’s why I wanted to thank you for all the effort you put into documenting your machining, anodizing and designing and improving of your reels. So far I have made six reels, the first three have a click drag similar to the design of Ralf Vosseler’s reels. The drag on reel number three is adjustable. Number four and five, the black S-Handle reels, have a click drag which I copied from a Scandinavian guy whose name I forgot. Number six has a click drag of your design and I am happy to tell you that it has the smoothest action and nicest sound of all my reels, so I will continue to work with this style of click drag. Reel number six was also the first one that I anodized and colored. Again, thank you so much for the great content on your blog regarding this subject. So far I am making those reels just for myself, each accompanied by a suitable rod. In this e-mail I will include a few photos of my reels. And if you search on YouTube for my channel (“Fusselkopp”), you can watch three videos of the making of reel number three. With best regards from Germany, keep up the great work! “Well, so here it is. Reel No.1 to No.3 have the same mechanism, two hollow pins with springs from a disposable cigarette lighter inside them. The pointed ends of the pins engage on a wheel with detents on the back side. This wheel is press-fit onto a hollow shaft, which rides on the center shaft of the reel. The spools themselves have one-way-bearings pressed into the center which ride on the hollow shaft. This lets the spool engage the drag shaft/wheel when line is pulled from the reel, whilst it runs freely as you wind the line back in. Reel No.3 has an adjustable drag. To achieve this, the described hollow pins and their springs are housed inside a cup, which the drag-adjust-knob presses against, as you tighten or loosen it. This system works well, but it is fiddly to install, the non-hardened pins and wheel are a little prone to wear and the one-way bearing, hollow shaft and wheel amount to some weight. Also the pins demand quite a lot of space in the axial direction, making it slightly difficult to design a slim frame. Reel No.4 was inspired by your work, but built mostly from stock that was on hand at the moment, so the dimensions came together on the go. The right side spool end (Delrin) plate has a lip around the outside with teeth are milled into. These teeth are engaged by a pawl (Delrin), which rides in a slot in the right-side end plate of the reel. The pawl is, again, actuated by a spring from a cigarette lighter. this system works really well, but also demands some space. The drag resistance is the same in both wind & unwind direction. Reel No.5 is just the upscaled version of No.4, with the exception of the slot for the pawl being milled off-center, so the drag resistance in the unwind direction is much greater than when winding in. Reel No.6 is pretty much modeled after your designs, so I don´t need to go into detail on the click mechanism. I´ll just say it works (and sounds) great, takes up little space and the resistance when pulling out line is noticeably stronger than when winding in. This reel was also my first attempt at anodizing and coloring, and I am really happy with the results. The design was a bit of an experiment, looked better in my head than in real life, but works. 77mm OD, 40mm overall width, WF4f and an insane amount of Backing, don´t remember the weight. 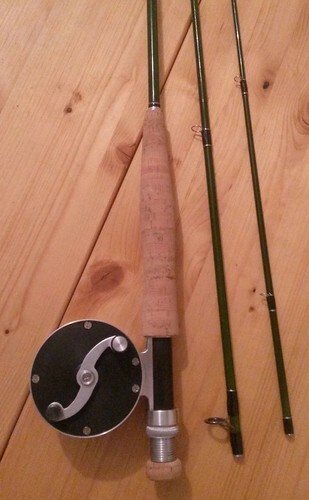 95mm OD, 45mm overall width, WF8F spey line(double-handed rod) plus some backing, never weighed. Feels heavy, but still a bit too light to balance a 12´6″ rod. Here is a link to Leo’s first video on making reel 3: Part 1 I found it quite entertaining. Links to the other two parts will appear when you watch this. In addition to making reels, I have dabbled with rod ferrules and reel seat hardware. Gerrit (The Netherlands) has found yet another project for the home shop machinist, fly tying vises. This is a beautiful design and execution. I wonder how he did the curved beam.